1-4 How is the fact of North Korean abductions acknowledged? Are there North Korean government official documents showing that North Korea committed abductions? From 2006 to 2007, the then Prime Minister Abe Shinzo justified the Japanese military “comfort women” system by insisting that there wasn’t “coercion in the narrow sense” as follows: “There wasn’t coercion that authorities entered houses by force and took people like kidnappers.” (Budget Committee of the upper house of the Diet, March 5th, 2007), “About this coercion in the narrow sense, I suspect anything that confirms this fact isn’t discovered. (Budget Committee of the lower house of the Diet, October 6th, 2006) Remarks by Prime Minister Abe do nothing but repeatedly distort the problem. According to this logic, how can we understand the North Korean abductions? If Prime Minister Abe’s logic is applied to the North Korean abduction issue, because activity whereby“ authorities entered houses by force and took people like kidnappers” isn’t confirmed, it is concluded that nobody was abducted by force. Yokota Megumi wasn’t taken away through means such as “entering her house by force”. 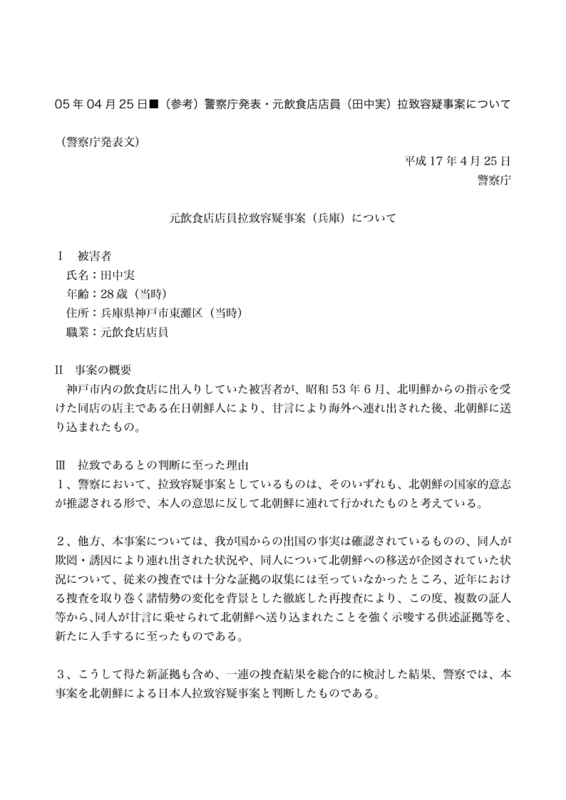 If the logic that it isn’t confirmed in the Japanese military’s official documents is applied, because North Korean government official documents confirming the fact of the abductions aren’t available, it isn’t clear whether abduction is true or not until such documents are discovered. Among people recognized by the Japanese government as being abducted by North Korea, some people were forcibly taken by means of direct violence such as Yokota Megumi, and others were “taken out of the country by means of flattery” (the National Police Agency’s announcement) such as Tanaka Minoru, who was a restaurant staff member in Kobe city. About the case of Tanaka Minoru, the police announced that it acquired “testimonial evidence etc. strongly suggesting that he was transported to North Korea by means of flattery from witnesses etc.” and recognized him as being abducted on the basis of this evidence. Testimonial evidence confirms the fact of abductions, even if they are not confirmed in North Korean official documents. He is recognized as being not forcibly taken but deceived by “flattery”, the act of giving excessive compliments. Still, the fact remains that he was abducted. It is natural for the police to recognize it in this way. What happens if Prime Minister Abe says to the families of abduction victims that they can’t be recognized as being abducted because the fact can’t be confirmed in North Korea’s official documents, or the members of the families were not taken to North Korea by means of “coercion in the narrow sense”? From the above, you can understand that Prime Minister Abe’s recognition is out of the question. Whether people are taken away by force or flattery, both is abduction, a crime. Prime Minister Abe and others’ logic is nothing but a double standard, spoken with a forked tongue.